The White House released a statement on Thursday night announcing North Korea has transferred the remains of fallen American service members. "At their historic meeting in Singapore, President Donald J. Trump and Chairman Kim Jong Un took a bold first step to achieve the complete denuclearization of the Korean Peninsula, transform relations between the United States and North Korea, and establish enduring peace. Today, the Chairman is fulfilling part of the commitment he made to the President to return our fallen American service members. We are encouraged by North Korea’s actions and the momentum for positive change," the statement reads. 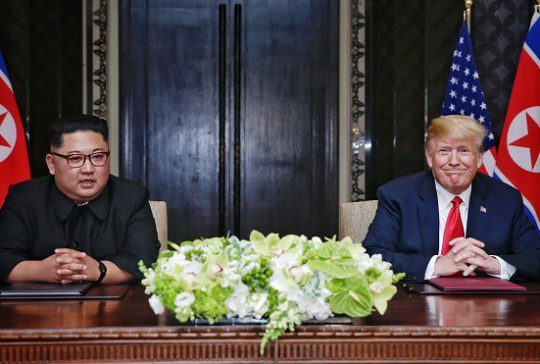 The gesture comes after the historic summit in Singapore between President Donald Trump and North Korean dictator Kim Jong Un. After the summit, Trump announced North Korea would return the remains of fallen U.S. soldiers from the Korean War back to the United States. The remains departed North Korea and will be transferred to Osan Air Base, according to the statement. A U.S. Air Force C-17 aircraft containing remains of fallen service members has departed Wonsan, North Korea. It is accompanied by service members from United Nations Command Korea and technical experts from the Defense POW/MIA Accounting Agency. The C-17 is transferring the remains to Osan Air Base, where a formal repatriation ceremony will be held on August 1. The United States owes a profound debt of gratitude to those American service members who gave their lives in service to their country and we are working diligently to bring them home. It is a solemn obligation of the United States Government to ensure that the remains are handled with dignity and properly accounted for so their families receive them in an honorable manner. Recent estimates put the number of American soldiers who had not yet returned home from the Korean War around 5,300. It is unclear how many remains have now been returned. "Today’s actions represent a significant first step to recommence the repatriation of remains from North Korea and to resume field operations in North Korea to search for the estimated 5,300 Americans who have not yet returned home," the statement reads. This entry was posted in National Security and tagged North Korea, President Trump. Bookmark the permalink.